In a medium size bowl add diced peaches, cinnamon, lemon juice, sugar, and cornstarch. Place three heaping spoonful’s of peach filling into the lower half of the pie crust, leaving a space between each spoonful so as to get three hand pies. Fold over the top half of the pie crust. Cut into three parts. Crimp the edges with a fork and seal the pie filling into the crust. Some filling (mostly juices) will come out during baking, that’s okay. Place on to a greased baking sheet. Bake at 400°F for 14-16 minutes. To a blender add 4 scoops of Vanilla Bean Ice Cream and one hand pie. Using milk to thin. Blend the shake to desired consistency. Repeat and make a second milkshake. Top milkshake with whipped cream and half of the third hand pie. Use the other half of the hand pie for the second shake. Seriously... a pie in your ice cream. When visiting Philadelphia this last January, I had researched places to go. I had heard really good things about an ice cream shop that wasn’t that far from our hotel. So we went and I had a milkshake that not only had pie in it but a WHOLE piece of pie on top. I couldn’t even finish the shake. 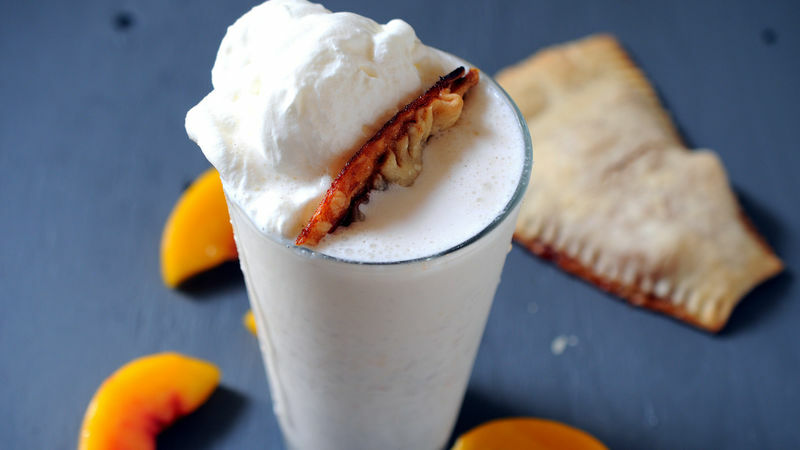 It was sooo amazing that I had to recreate the Peach Pie Milkshake similar to the one I had there. If you are feeling naughty, a little bourbon would be great in this. Pretty sure you are going to want to do this with any pie you make from now on! In a medium size bowl, add cut up peaches, cinnamon, lemon juice, sugar, and cornstarch. Place on to a greased baking sheet. Bake at 400F for 14-16 minutes.